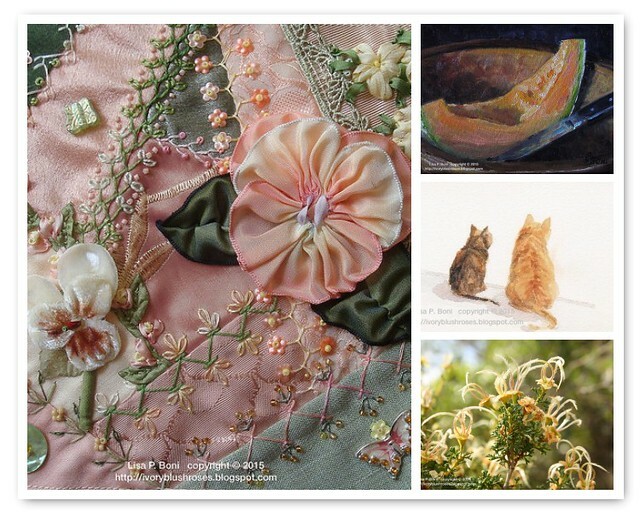 I finally had a chance to catch up on the Joyful Embellishment's seams. This is Stitch #18, a straight feather stitch with colonial knots in silk ribbon and ribbon stitch leaves. 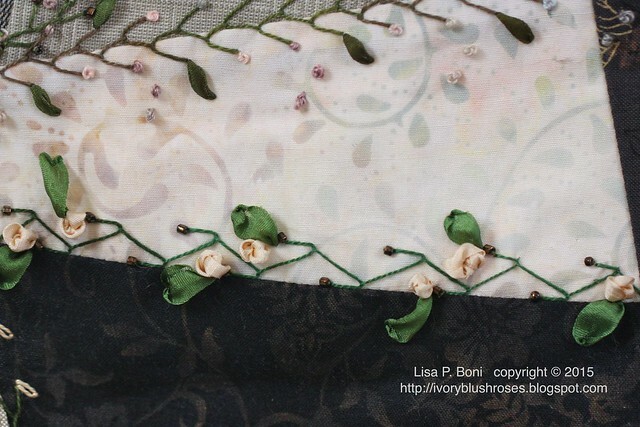 I love the way the 7mm silk ribbon came out looking like loose blossom buds in the colonial stitch! Definitely one I'll need to try again! 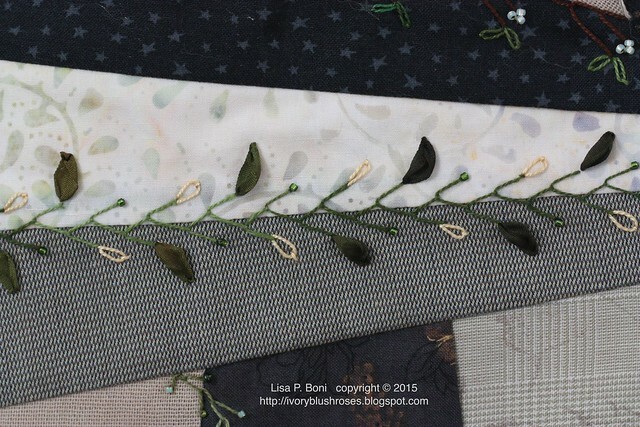 Stitch 20 is a simple feather stitch with lazy daisies, beads and ribbon stitch 7 mm silk ribbon leaves. Now that it is February, we'll be working on a new stitch. I'm trying to decide if I want to do the new stitch on this same piece or if I want to do them on something different. I'm thinking that I'd like to keep this piece all feather stitched and I have many more feather stitch ideas sketched out in my seam book that I could use! 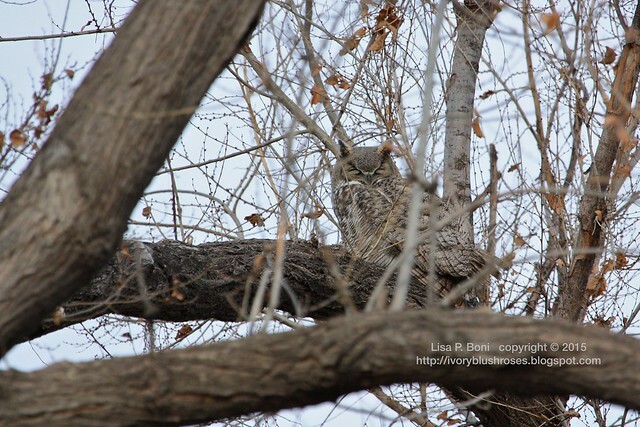 When I arrived home from work Friday morning, the owl was napping in the neighbor's tree next to my backyard! He stayed there nearly the entire day. Owls can't fly after a heavy meal, so they nap it off, so I am thinking that he must have eaten well that morning! I suspect that the owls have another nest in the neighbor's tree this year and can't wait to see! Unfortunately, a large pine tree has been gradually growing in my view of the nesting site, so it will be a little harder to see the owlets this year. 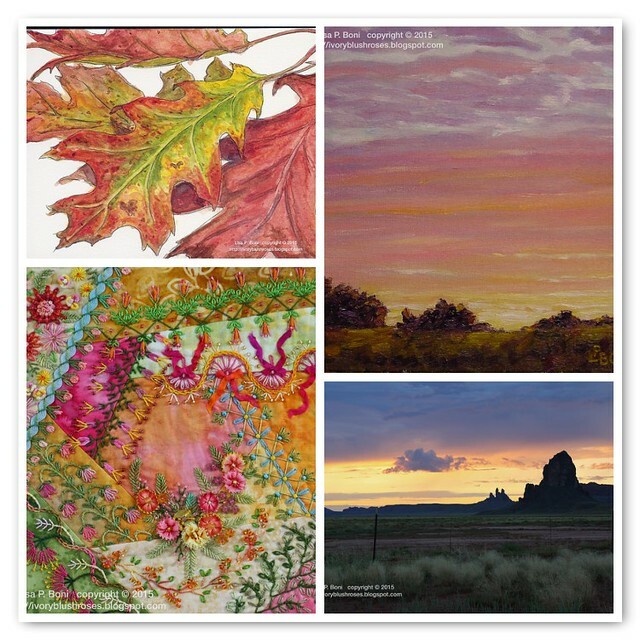 On Facebook, I was nominated to participate in the 3/5 Art Challenge by Allie Aller and Jeannette Sinclare. The idea is to share 3 pieces of artwork every day for five days and to nominate someone else to participate every day. I chose some of my favorites ~ though not necessarily my best work, but rather things that speak to me somehow. For Day 1, I shared the lovely peach colored Pansy block that I stitched in a round robin for Carolyn. Normally, I'm not much of a fan of those "orangey" colors, as you know... but I had the perfect ribbon to go on this block, so it's the one I chose to stitch. It's still on of my favorite things that I've ever stitched. A favorite oil painting was the piece of cantaloupe. More orange. But it sings so beautifully in the light! Another orange favorite is my big ginger cat, Thomas and his little brindled orange/black companion, Mollie. I captured them in watercolor one day as they sat looking out the sliding glass door. The flower is from a shrub on the north rim of the Grand Canyon. I have no idea what it is, but the feathery stamens captured the light so beautifully! Day 2 - The painting of the old white barns was one I worked on for a long time. I'm still not completely happy with the barns, but it's a scene that I just loved. The evening spring sun catching the tops of the grass and the newly sprouted corn in the field of deep brown soil. Just magical. Changing seasons, the watercolor of the gnarled tree was done at a friend's house on Cape Cod during super-storm Nemo a couple of years ago. Our dear group of friends got snowed in, with no power for three days! Fun memories! The blue and white stitched piece is another favorite of mine. I had been learning from Jude about cloth weaving and applied some of my crazy quilting embroidery ideas to it. I call it "Gentle Blue Dreams" and it hangs in my bedroom. The photo on the lower right is of the old Spanish mission church, San Xavier del Bec, south of Tucson. It's a beautiful old building and the fresh whitewash caught the sun so beautifully against that clear blue sky! 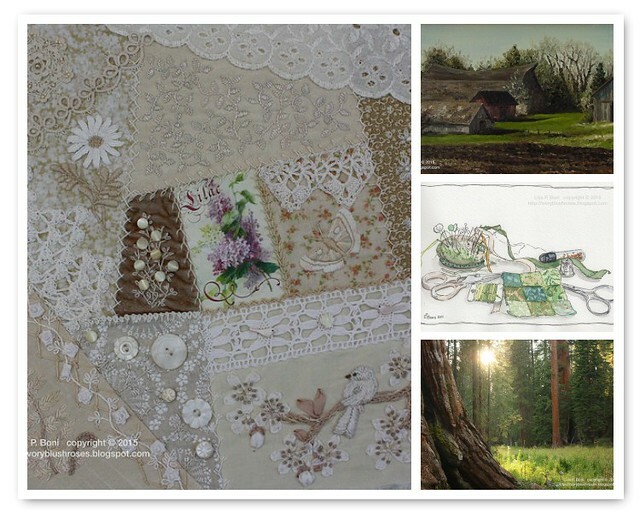 Day 3 - I shared block 4 of my cream/white crazy quilt. Finishing this quilt was a real milestone for me and it now hangs on the wall in my living room. Barns are one of my favorite things in the rural landscape and when I started oil painting they became a frequent favorite subject. I used to drive past this old farm with the sagging roof on my way to clinicals when I was in nursing school. In the spring, with the fresh green grass and the trees just budding into leaf and some new spring blossoms, it was a magical scene! This is one of my very favorite paintings that I've done. The little watercolor of some patchwork sewing was done while working on my Bunny Forest purse. I sold this to a friend, whose mother is a wonderful quilter. For me, this is such a typical glimpse of me at work! The photo at the bottom was taken in Sequoia as the setting sun shone through the forest of enormous sequoia and more normal sized sugar pines. I love the way the light is bouncing across the wildflower meadow. Day 4 - Back to more orange! It's truly strange to me how much I dislike orange, yet it creeps into my work again and again! The oak leaf watercolor was done after my mother brought me home a fist-full of beautifully hued oak leaves and said that I should try painting them. So I did! The sunset painting was from a photo I took while I lived in Iowa. I often drove the back roads when I needed a break from studying. On St. Patrick's Day, I sat at the corner of a field and watched the sun set. Later I translated it into a small oil painting that now hangs on a friend's wall. Someday, I'd like to re-paint this scene in a much larger format. 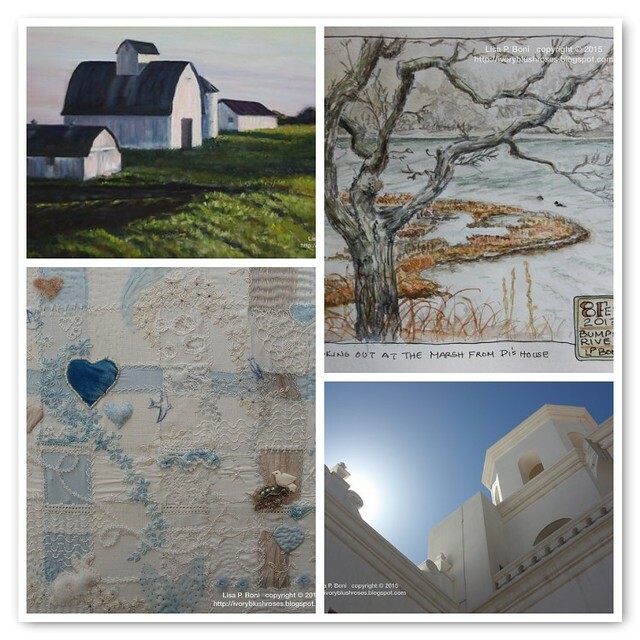 Of course you've seen the crazy quilt block recently as it is my CQJP 2015 January block! I really am having fun with the bright colors! Day 5 - It was hard to narrow down to the last few things I wanted to share as I could have shared SO much more! The seaside floral photo was taken on my trip to Great Britain in 2012 at Tintagel, legendary seat of King Arthur. It was a magical place in so many ways. The hillsides were carpeted with a lush tapestry of wildflowers. It was an afternoon that lives so brightly in my memories! The watercolor was done of my living room in the brief time in the afternoon when the sun shone in. Most of the day, the apartment was fairly dim due to being against a hillside, but during that brief hour in mid-afternoon, it was beautifully lit! The large photo is of one side of my Bunny Forest purse. I learned the tiny 9 patch stitching from Jude Hill and added the decorative kantha stitching to give it texture and interest. The trees were all made from various scraps of velvet, corduroy and upholstery fabrics that I had. It's such a wonderful tactile piece and I still use it daily! Someday, I hope to complete a small quilt in a similar fashion. 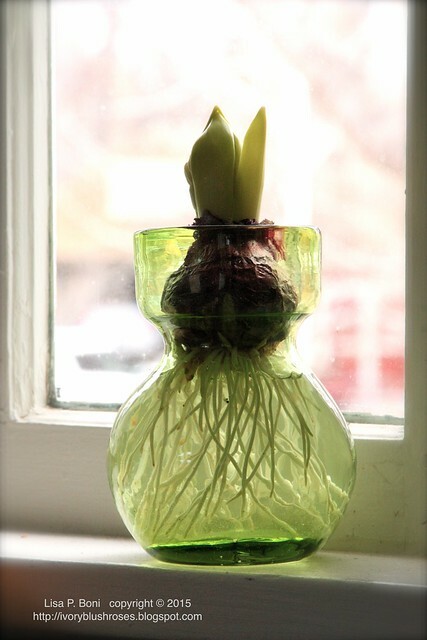 On the kitchen windowsill, there are several jars of hyacinth bulbs being forced into bloom! They've been putting out roots and growing down in the crawl space until now. When I first pulled them out, the leaves were mostly white, but with exposure to light, the chlorophyll is starting to turn them green! Having these precious blooms in the depths of winter is something that makes my soul sing! How amazing to see the owl. We had lunch at our local airport today and there was a snowy owl in the tree across the highway. Unfortunately he was too far away to get any pictures. Wow! Your needlework as always is exquisite. Your photos are great of bits and pieces of your life. Gosh, Lisa! The depth and breadth of your talent is just amazing! I'm blown away by the quantity and quality of your work. Not to even mention the time-management skills you must possess! To have a career, to produce so much beauty through your art and to share it through your blog is such an accomplishment! You're my hero!!! 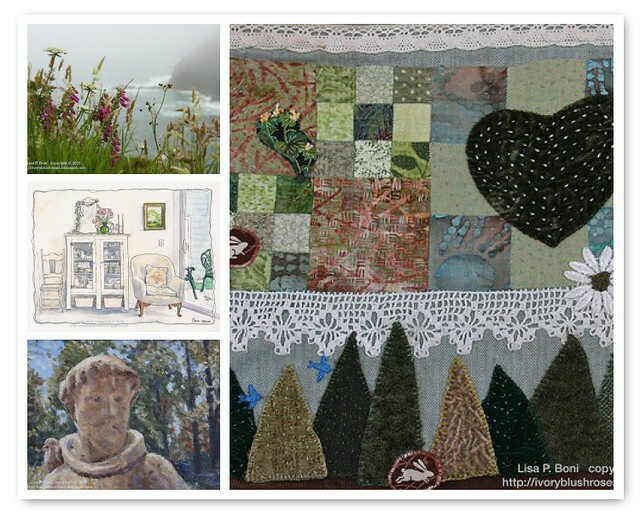 All of your work is so lovely-- paintings and quilts!